i started in on this year’s list last night. a bit dull, a bit like the ones I’ve made every year for the past decade but let’s have at it. 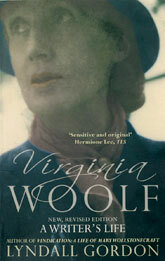 Inspired by the book my dear friend Claire gave me for Chrimbo, A Writer’s Life by Lyndall Gordon on my favourite but much ignored Virginia Woolf. (Much ignored by me. Not by the world.) VW wrote every day, her whole life — write, write, write. 1. Write, write, write. (a) In my journal/diary book, which is now mostly a collection of entries written when I am feeling particularly low. I used to write more often in the high school and university days — I resolve to write in it more. (b) Every day, work on that book (which I haven’t told you about yet). and (c) write here on this blog. 2. Read a wider range of books. Starting in on A Writer’s Life reminded me how seldom I read something that is not light and fluffy. Obviously I read a lot at work, but it’s a different kind of reading — reading to improve something rather than reading to learn from a book or be entertained by it. At home, I’ve been reading light fiction for the most part. And I adore it. But with A Writer’s Life, I can feel my brain twisting around, trying to figure out what VW was all about, trying to remember To the Lighthouse and The Waves. There’s a pile of non-fiction I’m keen to read: more Michael Pollan, Harold Evans’ My Paper Chase, The Talented Miss Highsmith, The Push to Prescribe. (Basically any book that is discussed on The Current I’ll want to read.) I am officially accepting book recommendations — fiction, non-fiction, anything really. 3. Eat real food and take a break from sitting. This is the mandatory “healthier lifestyle” portion of the resolutions. Making lunches, eating breakfast (which I haven’t done yet today. oopsy), making dinner from healthful ingredients, drinking loads of water and loads less diet coke, and (here’s an important bit) going to the gym. Eep. I signed up for a gym membership a little while ago (which is getting to be a longer while ago). I have not gone. I must go. So I do not turn into a sloth and so my bank account knows why it’s being dinged monthly for a not-insignificant amount of moolah. 4. Pay more attention to the world outside the shows on the CW. My interests have grown rather insular. I may be very well-informed vis a vis the Gossipverse, but who is the President of Canada? We have a Prime Minister? Still that Harper fellow with the stare of a serial killer? Unfortunate. 5. Save up some money. I have a not-so-secret ambition to go to a one-week surf camp in Costa Rica. This one looks like the most genius trip of all time: surf lessons, yoga, beautiful beachside huts, fresh tasty food. And you don’t have to know how to surf. But it’s not cheap. And I am not rich. Maybe this time next year my trip will be booked! Those are the main ones, at least for now, until I dream up more. Any good ‘uns I should add to my list? Do you dollies still make resolutions? All very good. Glad you like the book. the beautiful & the damned is a good one, agreed. i read it in university. but i have another unread fitzgerald on my shelf: the last tycoon. Iris Murdoch is officially on the to-read list. Hilarious, Ms. Calhoun! I share many of these resolutions. How well I stick to them remains to be seen, but I did something radical last night: I made a budget. My trips to Starbucks and lunches out need to be reduced greatly (if not eliminated altogether). I hope Green Basil can survive the downturn in business. Funny, I just made a list of to-reads today, a new year’s resolution list of my own. And I went to the gym for the first time in aeons – I know, I’m a cliche. I like your resolutions, CC. I’m currently trying a 6 week detox from alcolhol, which will be immediately followed by an enthusiastic retox. Lastly, I’m sad because I lost my notebook on new year’s eve (it contained my speech for the bride and groom). Double lastly – my sister thinks the prime minister’s name is Steve Martin. No joke. xoxo much love. Enjoy NYC. Do you know the latte factor? You can cut your Starbucks costs in half if instead of lattes you order plain coffee and load up on free milk.